Paper maps, a ham radio, Kodak film, a still camera and lenses, a weather radio, and maybe even a flip phone with limited coverage. Up until 2007 – in old beat-up trucks and cars across the plains – this was all a storm chaser required. Only a few hundred meteorologists and severe weather enthusiasts chased back then and they rarely left their home states to do so. Editor’s Note: This guest post was originally published in April 2016 and has been updated for accuracy, freshness and comprehensiveness. The game changed in 2007. Discovery Channel launched a new reality TV series on storm chasing. The nation was captivated and several young chasers drew inspiration from this show to go and witness storms for themselves. This influx of chasers meant a need for new tools to keep them aware of their surroundings, recording clean footage, and educating them on their role in the National Weather Service warning decision process. Chaser essentials were still cost prohibitive. A good camera with lenses cost close to $3,000, a ham radio around $350, a laptop around $1,000, a puck GPS and software around $120, radar software around $120 per year, and a data card around $50 per month with a 350MB limit. Not to mention cost of the setup, mounting and maintenance, and teardown times for taking the expensive equipment in and out of vehicles to deter theft when the chase was over. Smartphones changed the world of chasing. Apps such as RadarScope, which provided GPS and radar data live to your phone, started gaining momentum in the chaser community. Cameras became less expensive and capable of holding thousands of digital images. Cellular data became more accessible, covering dead zones in the plains where storms occurred and allowed for users to download several gigabytes per month. Despite all the new technology, chaser vehicles remained a mess of tangled wires, uncharged tablets and phones, cracked iPhone screens, and tablets flying around loose in a car. Storm footage remained shaky and of poor quality. The education of new chasers continues to be an ongoing issue. What’s next and what do I need to chase? Keeping a car organized and ready is the first step with any new tools. 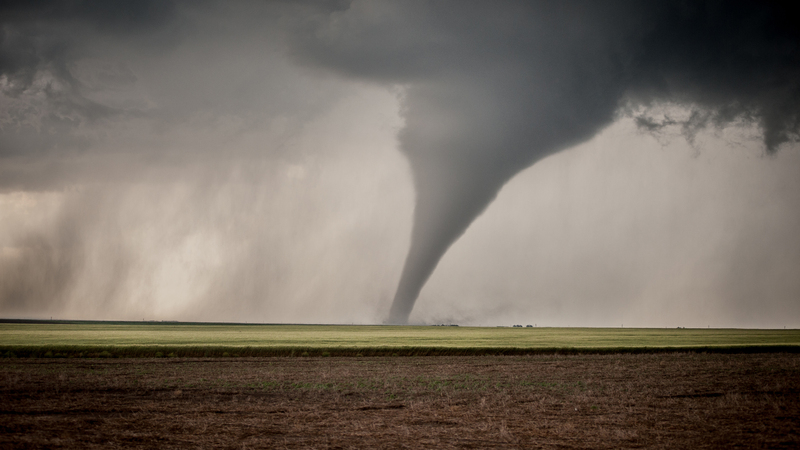 The lifeline of any chaser relies on the tablet and smartphone being charged and undamaged by drops as well as equipped with the easiest to use apps. 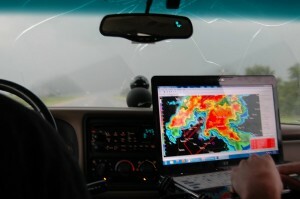 Chasers are constantly removing phones and tablets from the car, then reestablishing connections upon reentry; all while in a very bumpy supercell environment. Things simply need to work when one is out in the field chasing. IntelliSkin® for smartphones and tablets. With drop proof cases and a new unique quick release charging station built into their legendary mounting brackets, keeping a tablet or phone maintained has never been more seamless. Combined with no-drill stands, tablets and – for the few that still use them – laptops have never been more secure, decluttered, and easy to detach. RAM® Mounts mobile camera brackets such as their Twist-Lock™ suction cups and window scope pro products make steadying GoPros, iPhones, and cameras easy and quick to maintain. RadarScope with RadarScope Pro – the dual screen and their continued tie-in with spotternetwork has changed the game when it comes to maintaining situational awareness around the storm. The pro subscription even includes lightning data. StormTrack – free to sign up and allows for an online community of storm chasers to share insight on severe weather setups and educate new chasers on staying safe and forecasting. Periscope – not only can you live stream to all your social media platforms, GoPro can tie-in to show your viewers sights outside the vehicle. Tom Tom app maps – offline map source that doesn’t require pre-storing the map tiles for chases. Very reliable when it comes to acknowledging paved versus unpaved roads. Spotter talks by the National Weather Service office are a must for new chasers. Despite new apps and social media being a way to report, calling the office while on the road remains one of the most effective ways to relay reports. Pre-store the NWS office you’re going to before you leave town to make calling even easier. 4WD vehicle with good tires and proper maintenance. iPhone, iPad or other mobile device. 4G or better wireless booster and antenna. GoPro action camera with RAM® universal action camera adapter. Obey the laws of the road and if a novice, chase with someone who has experience first. This is a guest post from Tim Marquis, a meteorologist with Weather Decision Technologies, Inc., which is the creator of the RadarScope weather app. Tim is also an avid storm chaser. You can follow him on Twitter at @tmarquiswx. Featured image courtesy of Flickr user fireboatks under Creative Commons license.